Mid September 2017, we relocated our family and our business to Sydney. A fresh start, a clean slate, a new challenge. 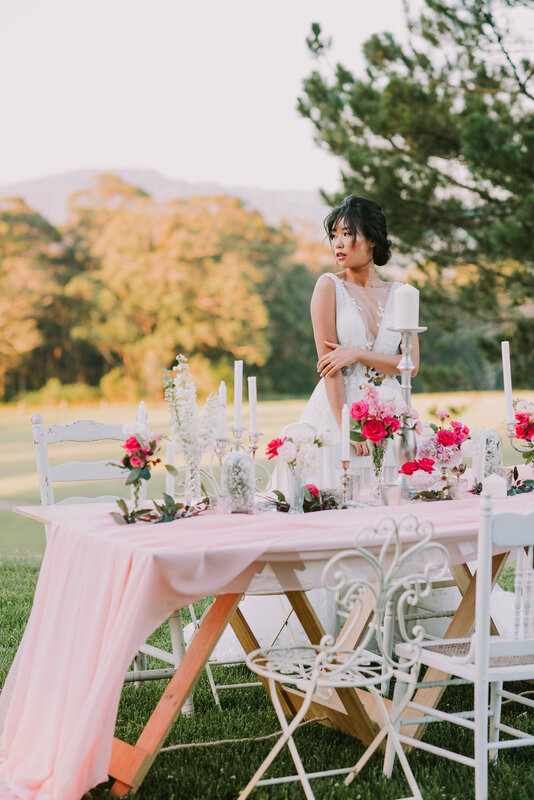 To make our arrival to the Sydney wedding scene known, I rubbed shoulders with some very big names and highly priced industry professionals to do our very first wedding styled shoot in Sydney. It was such an honour and also very intimidating to put together only my very second photo-shoot, but this time, with highly sort after industry professionals. The shoot was held on the grounds of Chapel Hill Estate and Reception Venue and in their Honeymoon suite – The Lake House. The house with its canopy king sized bed, couple’s swing bed under the veranda framed by the lake, was the perfect canvas backdrop for our bridal shoot. We styled a dreamy setting on the swing be to be envy of any romantic rendezvous. We found a giant pine tree at the top of a hill. 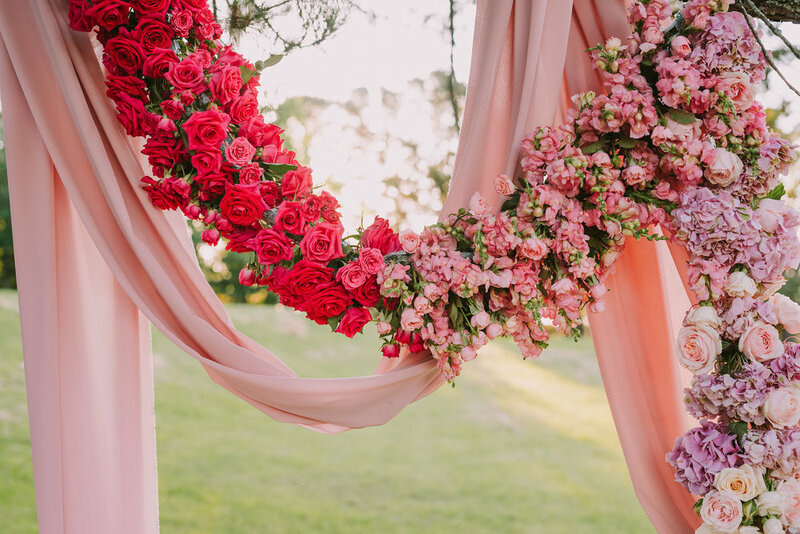 So, we created a flowing floral arch that was hung from a tree branch, draped in chiffon and a floral garland in ombre colors, which can be an inspiration for any wedding ceremony backdrop. Who says you have to have an arch structure to create a wedding ceremony flower arch? 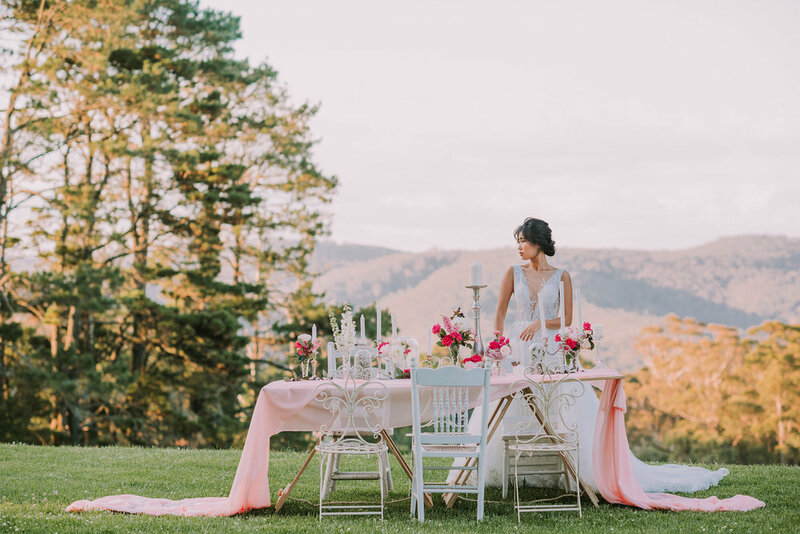 As the sun slips behind the mountains our themed dinning setting in chic vintage glam was framed in ombre hues of orange and pinks in the horizon. Can you imagine your wedding guests dinning at sunset against the mountain backdrop? Your wedding will be remembered for many years to come! Why ombre you ask? It’s different, the transformation of colors from one tone to the next is just mesmerising don’t you think? Thus, I created the bridal bouquet in a cascade to show off this color effect. And I never get enough of flower crowns. 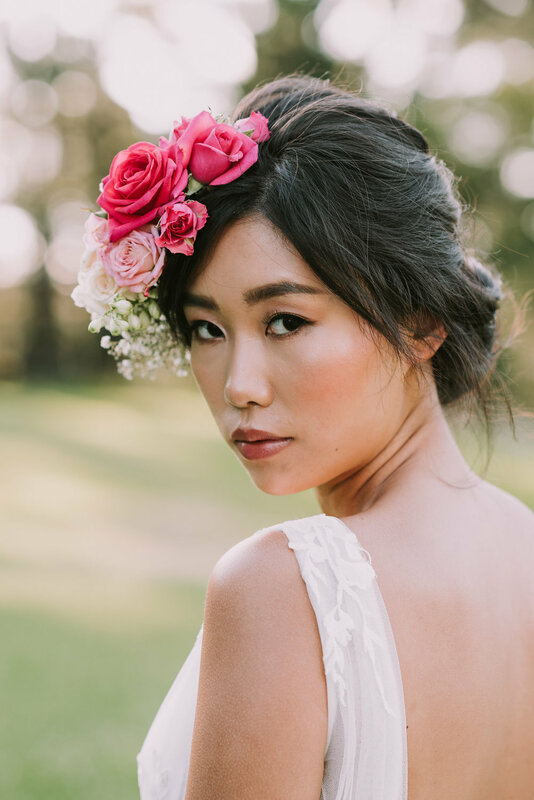 There is so many ways to wear flowers in your hair; flower wreath, flower halo, flower comb the options are endless. This one is a half crown, elegantly placed to the side of the face for that extra dramatic effect. Captivating motion picture by Andrew Choi - TopChoi’s Productions. 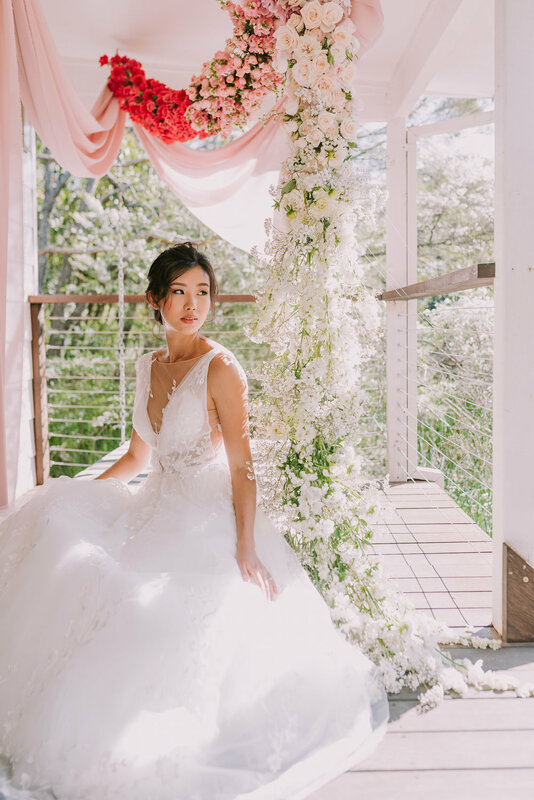 Elegant and luxurious bridal gowns from Emerald Bridal.